Motherwell needed a last-gasp strike to rescue a point against an impressive Ross County side in the Scottish Premiership. The visitors led through Michael Gardyne's first-half goal and were impressive throughout. 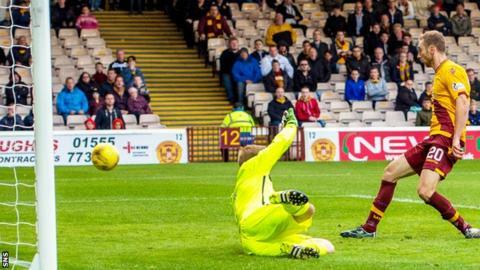 Motherwell looked sharper after Theo Robinson and Marvin Johnson came off the bench. The latter created the equaliser for Louis Moult, as the home side's urgency eventually paid off. County had to rely on their endeavour at first. Motherwell were intent on establishing their authority early on, and the visitors worked hard to make their own mark on the game. That started with a period of strong defending, since they prevented Motherwell breaking beyond the back line. Moult struck twice from long range - volleying wide then drawing a good save from Scott Fox - but that was the closest they could come to troubling the Ross County goalkeeper. County took hold of the game in midfield, with the central pairing of Jackson Irvine and Rocco Quinn delivering plenty of industry and hard running. The entire side was driven on by the sharp-edge instructions hollered from the touchline by manager Jim McIntyre. He was a hard taskmaster but the reward came when Jamie Reckord swung a free-kick into the penalty area. The Motherwell defenders failed to clear and, as the ball bobbled around the box, Gardyne pounced to steer a shot past home goalkeeper Connor Ripley. Creativity was a rare commodity and the second half was characterised by sweat and toil, yet little penetration. Irvine asked a question of Ripley with a shot struck on the half-volley from 25 yards, but the goalkeeper saved. As Motherwell desperately sought an equaliser, substitutes Johnson and Robinson became prominent. The former sliced an effort into the side netting, while the latter spun and shot from the edge of the box, Fox saving both times. Motherwell gradually became more assertive as County tried to see the game out. The hosts' leveller came after captain Keith Lasley sent Johnson scampering down the left. The winger was composed enough to deliver across the face of the goal for Moult to convert from close range. Relief at the end for Motherwell and frustration for Ross County. Match ends, Motherwell 1, Ross County 1. Second Half ends, Motherwell 1, Ross County 1. Goal! Motherwell 1, Ross County 1. Louis Moult (Motherwell) right footed shot from very close range to the bottom right corner. Assisted by Marvin Johnson. Corner, Motherwell. Conceded by Liam Boyce. Corner, Motherwell. Conceded by Chris Robertson. Attempt missed. Liam Boyce (Ross County) left footed shot from outside the box is just a bit too high. Substitution, Motherwell. Liam Grimshaw replaces Josh Law. Corner, Motherwell. Conceded by Richard Foster. Substitution, Ross County. Brian Graham replaces Jonathan Franks. Attempt missed. Jake Taylor (Motherwell) right footed shot from outside the box is too high. Substitution, Ross County. Martin Woods replaces Rocco Quinn. Attempt saved. Theo Robinson (Motherwell) right footed shot from outside the box is saved in the top right corner. Rocco Quinn (Ross County) is shown the yellow card for a bad foul. Attempt missed. Marvin Johnson (Motherwell) left footed shot from the left side of the box is close, but misses to the left. Attempt saved. Jackson Irvine (Ross County) right footed shot from outside the box is saved in the top centre of the goal. Substitution, Ross County. Richard Foster replaces Raffaele De Vita. Attempt blocked. Marvin Johnson (Motherwell) right footed shot from the left side of the box is blocked. Chris Robertson (Ross County) wins a free kick in the attacking half. Substitution, Motherwell. Marvin Johnson replaces Dom Thomas. Jamie Reckord (Ross County) is shown the yellow card for a bad foul.